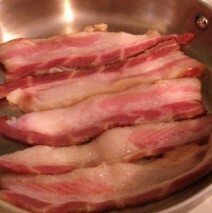 Nitrate free, hickory smoked bacon from our pastured pigs! I wish I could attach the wonderful bacon-y fragrance. I will have bacon at the Ottawa Organic Farmer’s Market on Saturday. Available at the farm too.